Recruit Ryan Wilkes could hardly believe his good fortune. For weeks the drill instructors here at Fort Benning Georgia had been all over him: in his face, screaming at him, pushing him beyond his physical limits. Now, here they were, merrily celebrating his birthday with him. The entire platoon sang Happy Birthday to him, and the DIs even got him a birthday cake to eat. “They told me to have seconds, even thirds of the cake if I wanted to,” Wilkes recalls. Happy 18th birthday, and welcome to the United States Army. It had been quite a journey for the lifelong Gardena resident, and one that wouldn’t be over soon. And there was no time to reflect on what the DIs had done to him in bootcamp. With his grasp of mathematical skills such as trigonometry, he became a scout/mortarman, and found himself moving up fast in the ranks. “I made Sergeant by the time I was nineteen, only eighteen months out of basic, which was almost unheard of, “ Wilkes states. 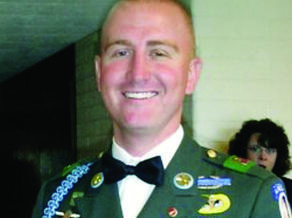 After a short stint in Vilseck, Germany, he was sent to Fort Polk in Louisiana and continued there until his three-year contract was nearly up. As a child growing up, Wilkes would watch all of the WWII movies with his Grandfather, a veteran of the Army-Aircorp. He thought that the parachutist of the era had one of the most exciting and important roles in the military, and he wanted to be one. After a few miscues, he finally got his wish and was assigned to the I-509 Parachute Infantry Regiment. But there were no openings for jump-school, and he would have to wait to get his “wings.” Until then, he was low man on the totem pole all over again. Finally though, a spot opened up and Wilkes found himself back at Fort Benning for jump school. He still remembers the day he graduated, standing in a long line of airborne wanna-be’s waiting to make their first jump. Before he had a chance to ponder his situation further, the jump light turned green and he headed out the back of the plane and into the wild blue yonder. There were many jumps after that initial one to earn his wings, and they weren’t the only ones he earned. The next pair he pinned on were from one of the Unites States erstwhile and long time enemies. Under the direction of a Russian Jumpmaster barking commands in Russian, Wilkes and a select group of soldiers parachuted out of an Antonov An-2 Colt, a Russian bi-plane that traces its roots to the end of the Second World War. The game was about to turn deadlier though, as Wilkes deployed in February of 2004 to Iraq. In a little more than half a year into his deployment, his Humvee was hit on Aug. 15, 2004. Wilkes was critically injured in the attack and lost half of his large intestine. He endured several operations to patch things up, but eventually was given a medical retirement as a Sgt. 1st Class in 2005. Today, Ryan Wilkes continues to serve our community, as an officer with the Gardena Police Department.